Looking at the polls in all 50 States is hard and takes too much time. Fortunately for us, there are experts out there who do this for a living. 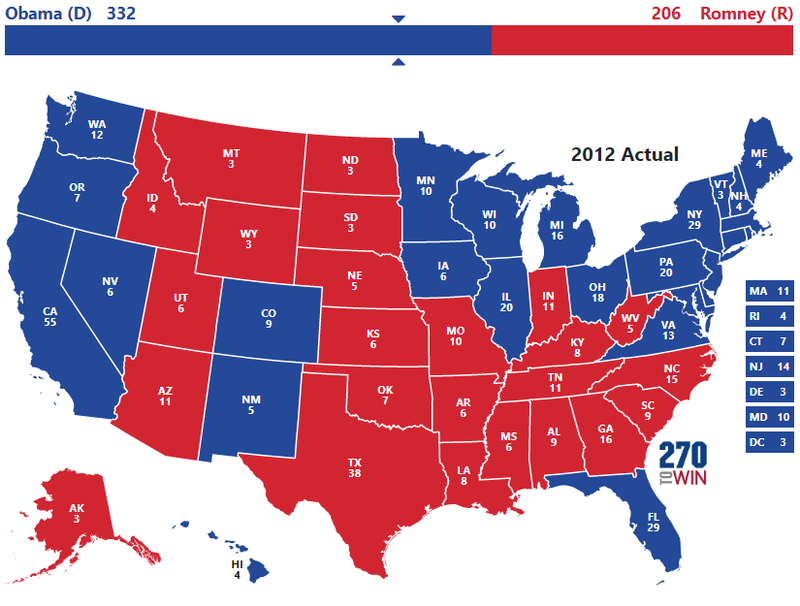 One such expert, Nate Silver, and the folks at his site (538 dot com) have a pretty solid track record of predicting the Presidential election using regression analysis of all the polls in all 50 States, among other data points such as voting history, demographics, etc. (See comments section in our 2012 post here noting that Nate Silver's model accurately predicted the 2008, 2010, and 2012 elections; and to be sure, he also accurately predicted the 2014 election as well). Their current electoral map is HERE. So how do things stand in August 2016? with a landslide 374 electoral votes for Hillary Clinton to Trump's 164. Again, this is August 2016, so it's fair to say that a number of these States will likely switch around, such as Georgia (which hasn't voted for a Democrat since Bill Clinton in 1992), Arizona (which hasn't voted for a Democrat in over 30 years with the exception of Bill Clinton in 1996) and North Carolina (which, although voting for Obama in 2008, hasn't voted for a Democrat since Jimmy Carter in 1976). Total of 157 electoral votes up for grabs. with Hillary Clinton winning 326 electoral votes to Trump's 212 electoral votes. [Editor's Note: unless something catastrophic happens between now and November, I think this is the likely outcome.] Keep in mind, this result assumes that Hillary loses every Battleground State that is not currently giving her at least a 75% chance of winning. So for instance, as of today, she has a 72% chance of winning the State of Iowa. To be sure, a 72% chance is a pretty good chance. Well over 50% right? If you had a 72% chance of winning the lottery, you'd run out right now to buy a ticket. However, because 72% falls below our imaginary line of 75%, we're going to assume for the sake of this simulation that Hillary loses Iowa and every other Battleground State where there is not at least a 75% probability for her to win. But I know what you're thinking: 75% is not good enough this far out from November. You're willing to accept the fact that States like New York and California, which are each currently showing a 99% chance of a Clinton victory, are not going to change their minds between now and November. But a 75% chance is too low. After all, if your doctor said you only had a 75% chance of surviving a medical operation, that means there's a 25% probability that you could die. Way too risky, right? So let's up the ante. Under such a scenario, since neither candidate reaches 270, the 12th Amendment dictates that the election goes to the House of Representatives to decide. Since the House is currently controlled by Republicans, arguably this would mean that Trump (a Republican) wins in the event of a tie. However, this is a highly unlikely scenario as the 12th Amendment has only been used once in the history of the United States (in 1824 to elect Andrew Jackson). Moreover, look at the Battleground States Trump would need to win in order to make this scenario a reality: Florida (voted for Obama twice and is currently giving Clinton a 77% probability of victory), New Hampshire (voted for Obama twice, voted against Bush in 2004 and is currently giving Clinton an 80% probability of victory), and Nevada (voted for Obama twice and is currently giving Clinton a 76% probability of victory). All of that to say, this scenario is highly unlikely. By now you're probably noticing the same thing that the RNC and Trump's staff have undoubtedly been noticing for some time: the road to 270 for Trump is an unlikely one. Even prior to the recent meltdown by the Trump campaign, the math was never in Trump's favor. As we mentioned above, the current make up of the Electoral College gives your generic Democratic candidate somewhere around 217 electoral votes right off the bat (depending on what you consider a "Battleground State"), while the generic Republican candidate only gets 164. Such is the makeup of Red States and Blue States. Although there are roughly about the same number of Red States and Blue States in America, the Blue States have more people and thus have more electoral votes.